I finally got fed up with the commercially available cages. Things bend all outa shape, fall over with wind or heavy plants,, just plain JUNK! So I made some out of cattle fence panels. Made eight for a trial run. Cages are 12" square(need to be bigger) and in two pieces so they will stack. Legs are long enough to go 12-16" into the ground and are 1/4" rod. Two legs per cage half, leaving one side free to be adjusted when they are set in place. I had some plants still on the ground. Set one half in place and push it in the ground, tie/hold (had a helper) the plant up and stick the other half in place. The halves are tied together with wires used to tie reinforcing steel in concrete forms. Ties are available at HD and Lowes, I already had the tool to twist them with. Next batch will be 16-18" on a side and 24-30" tall, not counting the legs. I'll make them as funds are available, need about 50 in all so it will get stretched out over this winter. Nice idea, it will get spendy though with having to go 2 high for tall varieties. They'll last several lifetimes though! where do you get the cattle fence panels? The mesh I want to use for the next batch costs $.21 a sq. ft., not all that bad. I can go up to 5' high easily with that. The cuts I got out of the wire I used this time made cages 24" or 26" high. The legs are long enough to hold the bottom of the cage 12" off the ground with 12" soil penetration. Material costs on these ran about $7 per cage. There's just no way I can get that down much buying in small quantities. Since my goal was to get something good I can absorb the cost. There are some on the market that would probably be as good but the price is higher, not counting my time. 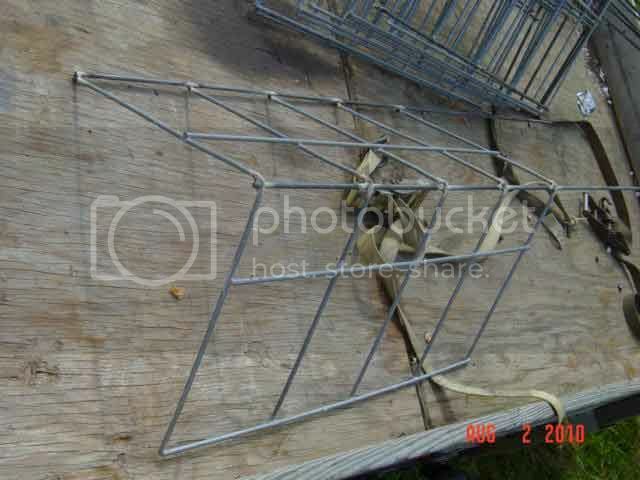 I recently posted about the cages I will make for my next planting of tomatoes for my fall garden. I'll use a roll of 10 gauge concrete reinforcing wire measuring 5' X 150' with 6x6 inch openings to make the cages. Cut the stuff off the roll in 6 foot intervals and use wire to hold them together when rolled to make the ends meet. Each cage will be approximately 2 ft. in diameter by 5 feet tall. The cost of the wire with tax is not quite $100 making each cage cost about $4 each. I will place this around the tomato plant and stake the cage to the ground with the 2x2 wooden stakes I've previously used to prop my tomatoes. The only drawback to this is the wire is not galvanized or otherwise coated. It is raw steel and will rust, but at 10 gauge, it will be around for several years. [quote="731greener101"]Gumbo,I am already using the cages of which you write.I found that size to be too small when I made the first one.That size will do fine with small varieties but not for larger varieties. So just what size did you finally decide on? Inquiring minds want to know!! I grow what locals call a Creole Tomato and those vines, along with a few other large fruit producing varieties tend to grow quite tall and have lots of foliage that can overwhelm a flimsy or short cage. I generally plant a dozen Creoles, some Better Boy and for quantity, I'll put in some grape and cherry tomato varieties. I like your design AinV. If I could only manage to move one of those panels, I would try making some myself.... I couldn't even lift up one end of one (I think it was a cattle panel -- one of those livestock panels anyway) when I saw them in the outdoor large materials yard at Tractor Supply. Those are the ones! I used a cordless saw to cut this one in half at the TSC here, then it fit nicely on top of my toy trailer. Once I had it home I cut the pieces to size with an angle grinder and cutting disc. Took me less time to cut it into 16 pieces that it did to cut the 11 rods with the wimp-o-matic battery saw. I very nearly bought one of those when they hit the market 20 or so years ago. After this little test run I am now so glad I didn't. Those are pretty cool. I like the stack-ability. I am using Concrete reinforcing wire right now and even they are too short. I am going to have to affix something to them this weekend cause some of my plants are about 8 feet tall right now. This is a great idea. How did you attach the 1/4" metal rod to the cattle panel? Did you weld it? I don't have a welder, but I thought that maybe some JB Weld and duct tape would secure the rod adequately. What are your thoughts on that? Great idea. 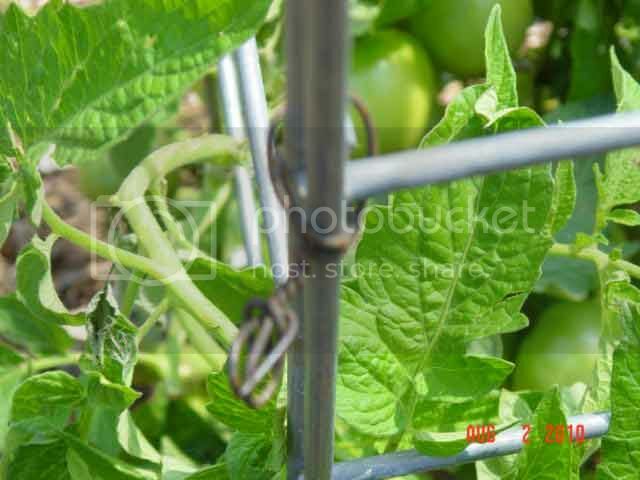 The heavier gauge wire is needed for the tomatoes. I use the commercial tomato cages for cucumbers and beans and open them up to fence the garden. For tomatoes I use CRW 7 ft roll. Mine are used year round so I don't have storage issues, but it only required me to find someone with a truck and people to help me carry the roll since it is very heavy. I used bolt cutters to cut the wire to make my cages and I use trigger snaps to keep them in a circle. It makes it easier for me to take them apart when I need to pull out the tomatoes, change the soil or pull the weeds. It also required minimal tool skills. CRW 7ft x 50 ft sells for $162 at home depot. a 7ftx 42 inch panel sells for $8.65 but I would need to have more than one panel and I would have to tie and stake them together = more skills required. To make a circle about 2 ft in diameter I need a 6.28 ft wide panel. I usually cut my wires square 7ft x 7 ft. I can get 7 cages from a 50 ft roll with one cage being 8 ft wide. the cage is big enough that I can push the vines back into the cage and I don't prune tomatoes unless the leaves are in the way. Since seriously downsizing my garden, I can't really use up a roll of wire like that. I've been using a t-post - none of the commercially available tomato cages are worth spit IMNSHO, I'm using "tomato towers" for eggplant stakes because they're not good for actual tomatoes, LOL! I've been using a single T-post per plant and ties. I am considering switching to 3 to 4 t-posts around each plant, and garden twine horizontally to make twine "cages" in the future. 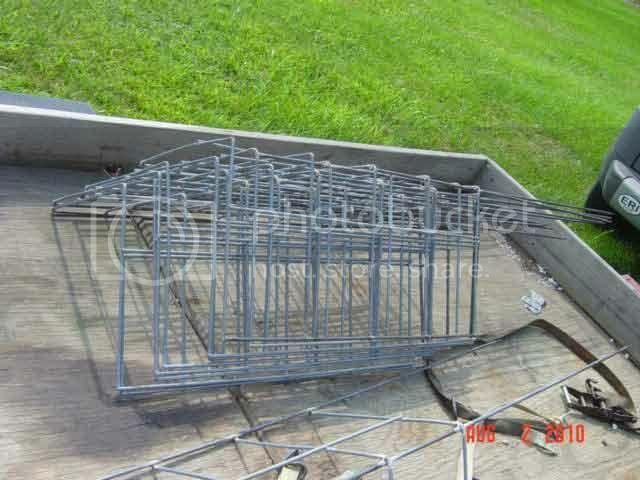 I had some concrete reinforcing wire cages that my dad gave me that were already several decades old. I lost them in the divorce, or rather just prior to the divorce - as in, he threw "that rusty junk" out while we were separated. They do last virtually forever. 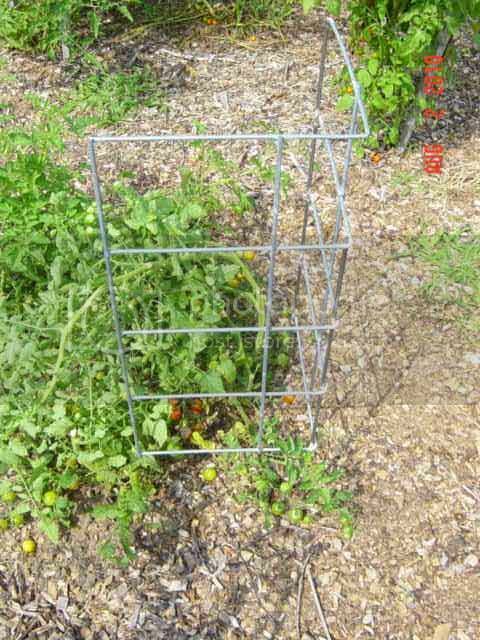 Prices on tomato post and cages!